CnetSDK .NET PDF to Text Converter is compatible with ASP.NET, C#, VB.NET applications. It can be worked as a PDF text extractor and a PDF to text converter for ASP.NET web projects. If you need a .NET web application library for PDF text extraction and PDF to txt conversion, CnetSDK .NET PDF to Text Converter library is the right choice. Accurate and fast PDF text extractor and converter features can be easily integrated into your ASP.NET web projects. After downloading the free trial of CnetSDK .NET PDF TEXT Extractor & TXT Converter, you may directly add the library dll into your Visual Studio ASP.NET web project. Please choose the suitable ASP.NET PDF extractor & converter library dll based on your Windows System (32 or 64 bit) and .NET Framework (2.0 to 4.5) version. As for free trial package of CnetSDK .NET PDF to Text Converter, you can only get and extract text from the first five PDF pages, or render & convert these pages of PDF to txt file in ASP.NET project. If you want to use this ASP.NET PDF text extractor & PDF to text converter library to extract and convert PDF file, please make an order for product license. CnetSDK .NET PDF to Text Extractor & Converter for ASP.NET provides mature APIs for you to recognize and extract text from PDF file, and transform & convert PDF to a text file. You can load a PDF document from Stream or String to ASP.NET web project, and then extract PDF text and show it on ASPX web page. Here, we provide the C# class code and VB.NET class code for your quick evaluation. // Prepare a PDF document for your ASP.NET web project. // Create an instance of .NET PDF text extractor object. // Load your PDF document to ASP.NET web project. 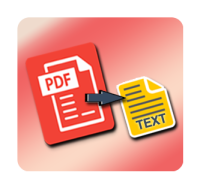 // Recognize and extract text from the first page of PDF. // Output and show text on ASPX web page.
' Prepare a PDF file for your ASP.NET web application.
' Create an instance of .NET PDF text extractor object.
' Load your PDF file to ASP.NET web application.
' Get and extract text from the first page of PDF.
' Output and show text on ASPX web page. If you want to see more .NET APIs for ASP.NET web application PDF text extraction & PDF to text conversion, please refer to this online tutorial: Online Tutorial for .NET PDF to Txt Converter & PDF Text Extractor.